Brown added that discrimination issues in Virginia 'are much more explicit' than they are in Oregon. Add Oregon Gov. 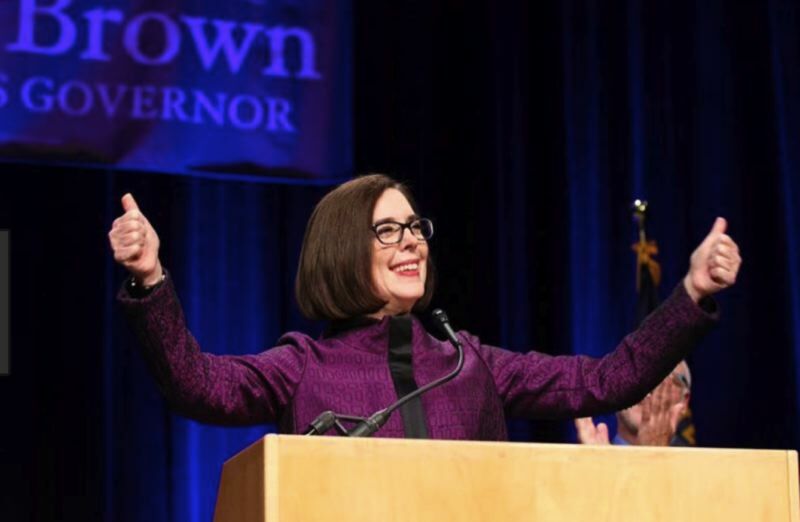 Kate Brown to those calling on Virginia's embattled governor to step down. Asked in a meeting with reporters Thursday about news that a racist photo appeared on fellow Democratic Gov. Ralph Northam's medical school yearbook page, Brown called the revelations "appalling." "He should resign," she said. "We still have more work to do in this country. A lot more work." Northam has been under fire since the photo — which featured a person in blackface standing next to a person dressed in Ku Klux Klan garb — was first unearthed last week. He has since refused to resign, despite growing calls to do so. Northam has also denied appearing in the photo, but acknowledged donning blackface on a separate occasion. Complicating the matter are scandals now confronting two people in line to take Virginia's governorship if Northam resigns. Lt. Gov. Justin Fairfax has been accused of sexual assault, which he has denied. And Virginia Attorney General Mark Herring also acknowledged this week that he wore blackface at a college party. Asked generally about the situation Thursday, Brown expounded on the issue of racism in public life. "I think part of it is awareness, honestly, on these issues," she said. "I think some of it stupidity. I think we need a broader conversation in this country about race and the impacts of racial inequities and racial justice." Click here to read the rest of the story by Oregon Public Broadcasting, a news partner of the Portland Tribune.